Twitter party is tonight 8 PM CST/ 9PM EST — Let’s get ready to chat about school lunch! 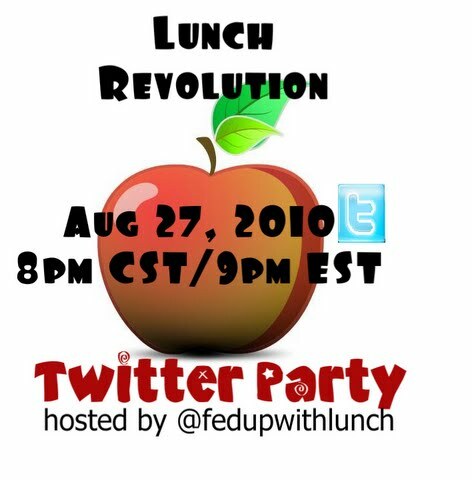 Here’s a the Tweet Grid again so you can watch in real-time what people are saying using hashtags #schoollunch or #lunchrevolution or anything tweeted to @fedupwithlunch or @scatteredmom. That’s one of the ways I’ll be tracking your tweets. Chat with you tonight! How is “Back to School” going for your family? Well, it hasn’t started yet. I go back next week and the kids come back after Labor Day. Is school lunch important part of your child’s day? Our son goes to day care and obviously we pay for meals (it is included in the fee). We send our own organic milk with him even though regular whole milk is normally provided. Last year I sent the occasional additional menu item to supplement his lunch. It’s leftovers from the previous night’s dinner: one time it was salmon and another time carbonara pasta. His childcare providers told me the other kids wanted the food and how delicious it smelled. They high-chair-fed before so it was easy to segment out small, individual portions. But now he’s in a different room with older kids and they sit at a table. I need to find out how it would work to bring in additional food when other kids could easily reach over and grab what I bring. I don’t care if they eat it, but I’m sure their parents wouldn’t want that especially if there is an allergy. I’ve got to have a chat with them right away. What is school lunch like at your school or your child’s school? At my son’s daycare they have a cook and certainly provide better food them I eat at school for the project. However I pay substantially more money for everything there so I expect that. Things I like on the menu include scrambled eggs, ground beef and pasta, rice, and soup. Last year was his first year at this particular day care. On the menu they had fish nuggets. I asked, “What kind of fish is it?” When they couldn’t find the answer I knew I had to provide something on the days they offered fish nuggets (they have since changed that menu item). I also asked about the tuna that they offer to make sure it wasn’t albacore (it’s chunk light). I think they are looking closely at their menu as early last year they switched to all whole grains in breads and pastas. The director told me that there was not even a single complaint from any child after that change. They still have a way to go, but I have seen baby steps. Does school lunch need to be reformed? Absolutely. It’s the kids who come from homes where they don’t have access to good food who rely on the school to provide their best meal of the day. For example at my son’s day care, his best meal is not lunch. Every morning I feed him breakfast at home even though I could take him to daycare and they would feed him a breakfast of cereal and milk. During the winter he gets oatmeal (actually today he requested oatmeal!) I like him to have a hot breakfast on cold days. And then dinner at home is nutritious and planned by me. Last night it was ground turkey in tandoori sauce (delicious sauce from a jar) with a wild rice, lentil, and black bean dish. Simple and nutritious. I feel for kids who don’t get good meals at home. Do you write notes in your kid’s lunches and what do you write? Too young for notes, but I liked this question because when I was a girl, I loved getting notes from my mother. How much time should kids get to eat lunch? Kids should get at least 30 minutes. In the business world an hour is common. That’s because many important deals happen over lunch. And they need a break. Kids are learning how to eat especially the really little guys and they need help with everything. Plus they need a break from academics. They need to value the meal. What are some products that you use when you pack lunch? I use Corelle products with little Rubbermaid lids. They are microwaveable. 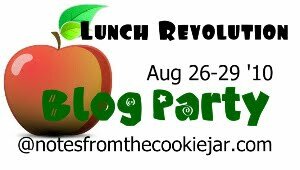 Check out all of the prizes on yesterday’s post as well as on Notes from the Cookie Jar. I agree with your comment about kids needing at least 30 minutes to eat but in reality how many schools really give them that much time? I have a friend who works at a very high class child education center and I don't think they take as much thought with the food they serve there as your childs. I'm glad that they are at least aware somewhere. Thanks for sharing! I don't know where you get that an hour for lunch is common in the business world. Everyone I know gets 1/2 hr if they're hourly and if they're on salary they eat their desks while working and only take time to pick up food if they didn't bring it from home. No one has time for an hour because there is too much to get done unless you take the work home. At present, I'm unemployed but during the last year at my corporate job, I took exactly one lunch break. I took that lunch only because a good friend sold her home and would soon be moving out of state. It was our last chance to visit in person for a very long time. I used to mostly graze at my desk on lunch & snacks I brought from home. I rarely took the time to get takeout even if I forgot to bring lunch (about once a month). I kept food in my desk that I could turn into lunch, if necessary, such as peanut butter, rice cakes, crackers, dried fruit, nuts, tuna in a pouch, cereal, and a box of soy milk. Most of my coworkers kept Hot Pockets or Lean Cuisines in the freezer in our office kitchen. Yuck! Most of my colleagues and I were required to carry a blackberry and monitor it 24/7 including holidays and vacations (yes, vacations). You would think our work saved lives but, of course, it didn't. Once I go back to work, I'll have to re-learn how to take a lunch break! I send lunch notes to school with my son. Can't wait for this school year to start so I can put them in there again! I've been doing it since Kindergarten(before he could read well). I'd write his name(which he recognized) and then pictures or different things, smiley faces, googley faces and signed it Love, Mom with xoxoxo at the bottom. A couple of times I would draw an eye, a heart and the letter U .. he knew what that meant. I looked at it as an opportunity for him to be excited about reading something and as he got older I sent slightly longer notes. He really loved getting and reading them. I found it makes him feel special and also encourages him to write notes to me and other important people in his life. It takes 20 minutes for your brain to catch up to your stomach. So if you have an hour to eat a meal you can take your time, not bolt your food, eat a reasonable amount and not over eat because you know when you are full. In school, lunchtime is the one time kid get to talk, they talk, and eat fast. They only have a few minutes, usually 20 from the time they leave the classroom to the time they leave the lunchroom total. So when they get back to the class room they are either over full or find they have not eaten enough. These are children, not cattle. The powers that be do not deem lunch time as learning time so it is not valued. It is made as short as possible so kids and teachers can get back to the valuable business of learning…I say lunchtime is learning time, but what are we teaching? That processed food is in fact food. That it is okay to eat fast and without manners. To not value good food. That chocolate milk and strawberry milk must be good for you the school serves it. And so much more that isn't right. Think of what we could be teaching at lunch time if it were valued as learning time.